The collection encompasses over 500 items, for the most part guitars as well as other plucked instruments, but also vintage amplifiers, record players, straps, leads, plectrums, catalogues, tutors, etc. It can be exhibited as a whole or in part for a fascinating journey covering fretted instruments in the western world between 1920 and 1970. Don’t look for the nec plus ultra Gibson Super 400 or the rarest Fender Stratocaster on the market. Here, you can learn more about the instrument you play or the music that you like, where it originates from, how it really sounds and why people shouldn’t settle for a clone with a thick layer of polyurethane varnish. Regular updates will take the form of features on selected topics as restoration progresses, such as for example ‘tenor banjos’ or even ‘mail order guitars’. 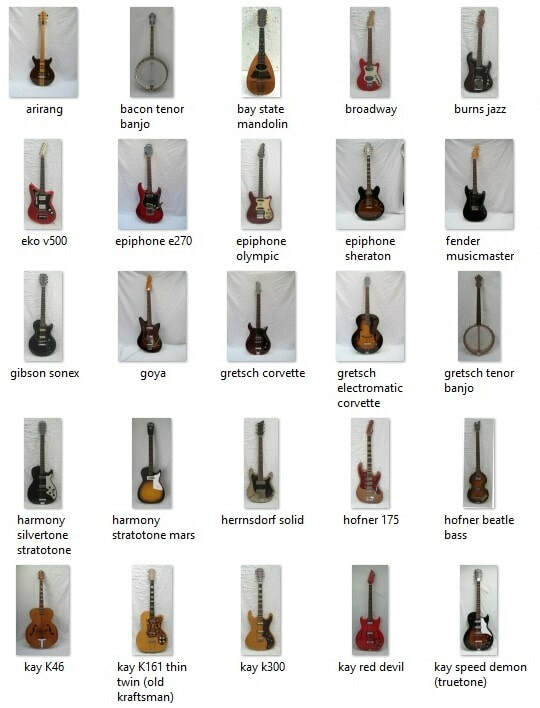 Next update: Kay electric guitars. In a very early stage the company that was to become Kay was involved in experiments with electric guitars. In the late ' 50 and the early ' 60, they produced electric guitars in large quantities under different brand names. Kay was and is like a concept of Harmony in music world. Both brandsremained unknown in Europe, partly because the export of never to Europe only after 1969.The demand was so great that the quality went down. Three years later, Kay was taken over by Valco. After the name Kay was later only used by manufacturers and dealers of foreign guitars. In 1942 "National Dobro" changed into the "Valco Company" and started producing instruments under brand names like "National", "Supro", "Airline" and others. In 1961 they debuted with hollow fiberglass bodies called "res-o-glas”. In 1967 the company merged with Kay though sadly the firm closed down the following year. Mario Maccaferri is famous for his typical gipsy swing guitar, designed in 1923 for distributor Selmer in Paris. Less known are his later activities as inventor and businessman with a rock solid faith in the new material: plastic. After the Second World War, electric elements and compound accessories for acoustic guitars were favoured, especially amongst jazz guitarists. The advantage was a natural-like, louder sound without much actual harm to the instrument. The downside: more feedback than with fixed pickups.